As we all know every new HYIP is a new challenge for all potential investors out there regularly checking HYIP monitors to find something worthy. This week is not an exception at DavidNews.com monitor and we have a new challenge to be reviewed in this post today. It’s a program called TatWex, which joined the Golden Stage on DavidNews.com seven days ago. It has been online for 14 days in total and I have already reinvested $400 to keep you updated on the payment status. Did the name TatWex ring a bell for you? I had no associations at all after hearing the name of this program. However, let’s take a closer look at the investment plans and program itself to see if it has anything interesting to offer and if the website can provide an answer to my question about the meaning behind the TatWex! 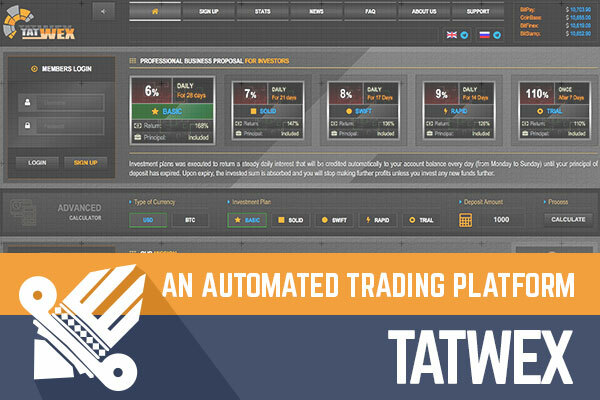 TatWex is another investment plan rich program, offering five investment plans. The first four plans (Basic, Solid, Swift and Rapid) offer from 6% (the first investment plan) to 9% (the last investment plan) daily for 14 up to 28 days. In the meanwhile, the fifth plan called Trial offers 110% once after 7 days. For all five investment plans, the initial deposit is included in the payment. The minimum deposit is $10, and the maximum deposit is $100000. The minimal withdrawal amount is $10, which might be the downside of it. The processing time for withdrawals takes up to 24 hours on business days and up to 48 hours on weekend and holidays. TatWex accepts the following payment options - Perfect Money, Payeer, Ethereum, Bitcoin, AdvCash, Litecoin, Dash. Worth remembering – the funds can be withdrawn using the same payment method as used to deposit. What does TatWex team have to say about themselves? Former traders with technology backgrounds and engineers who build software and analytics to solve the most complex problems in finance. As we all know very well behind each HIYP stands a highly experienced team of professionals but unfortunately, it doesn’t protect the investors from losing their money when program stop paying. In short, TatWex is an automated trading platform and they have developed their own cutting-edge technology that utilizes High-Frequency Trading. I’m not an expert in this field, but I have read a lot of HIYP legends, and this one seems quite generic and doesn’t stand out at all. The website is available in English and Russian. According to Alexa rank, the main source countries of visitors are Japan, Russia, Azerbaijan, Ukraine, and India. TatWex has chosen to avoid social media in their marketing approach, therefore it’s hard to add anything about their main audiences and potential investors. Another aspect I have always checked for while writing HYIP reviews is company registration details. I know it’s not an aspect that can determine a successful profit, but I believe it says something about admins. Unfortunately no company registration details on this website. In case you are willing to find out any extra information about TatWex you can try to contact admins using the contact form on the website or send an email. If the website doesn’t provide enough information to write about and to make any judgments, then I must dig deeper. In fact, I checked several forums but all I could find was a usual chatter about good or bad. One thing I could agree with some forum participants is that the investment plans seem to be very generous. The questions if it’s not too good to be truth? Only one of the plans has completed the full cycle – after 7 days but it’s not one of the most generous plans and we can’t make any conclusions yet. TatWex offers five plans for potential investors. 4 plans are so-called “for a certain amount of time”, but 1 plan – “after a certain amount of time”. These are just different ways of displaying the potential profit. Let’s take a closer look at their first investment plan called “Basic” to understand how beneficial TatWex is. In short, a deposit of $200 in this plan (6% daily for 28 days) would reach the breakeven point in 17 days. At the end of the 28-day period, the net profit would be $136. I believe it’s a quite good profit for 4-week investment. Remember - before you invest in any of the plans, use the investment calculator on the website to understand the real benefit of your planned investment. We are looking at a HYIP, whose admins, in my opinion, have chosen to take the easiest way – simple even old-school website design, as little information on the website as possible. Moreover, low profile but very targeted marketing approach excluding social media. In fact, I doubt the impact of social media activities in overall HYIP marketing. Often social media profiles look fake and they wouldn’t convince me to make an investment. However, apart from the website, the investment plans seem very generous. Either you want to wait and see what will happen when the first investment cycles of first 4 plans will be completed (14, 17, 21 or 28 days) or you are already willing to make an investment - don’t invest more than you can afford to lose! Nobody is capable to predict what will happen to any HYIP tomorrow or week after. Have you already invested in TatWex? Anything to share with us? Drop a message in the chat box! Investment plans: 6% up to 9% daily for 14 up to 28 calendar days, initial deposit included in the payments. 110% after 7 days, initial deposit included in the payment.